The diploid megaspore mother cell gives after meiosis 4 haploid megaspores from which only one survives and gives the 8 haploid cells of the embryo sac after 3 mitosis. 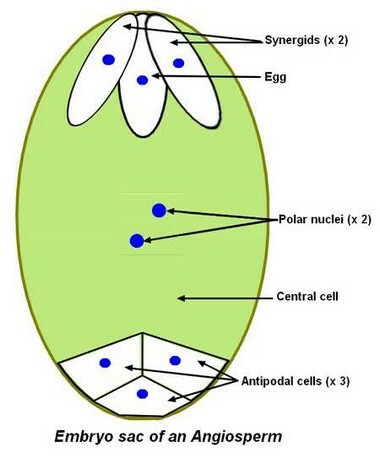 The 8 haploid cells of the embryo sac are: – An egg surrounded by 2 synergids at the micropilar end of the ovule, – 3 antipodals at the chalazal end of the ovule, – 2 polar nuclei of the central cell at the centre of the embryo sac. These 2 polar nuclei can combine before fertilisation.